Many people, especially teens, need braces to straighten misaligned teeth. Dr. Alexander Visot offers Invisalign® braces right from the comfort of his Woodland Hills, California, office. This innovative treatment can spare you the discomfort and unappealing look of traditional braces while still straightening your teeth. The results are amazing and the treatment time is short. Call or use the online scheduling tool today to set up a consultation with Dr. Visot to learn more. Invisalign treatment refers to clear braces Dr. Visot offers at his offices. They’re practically invisible and can help straighten your teeth without some of the drawbacks of traditional braces. Traditional braces can be uncomfortable and make you feel less confident. With Invisalign, you can get all the benefits of traditional braces without the hassle. First, you schedule a consultation with Dr. Visot. Together, you develop a customized treatment plan. During your first visit, he creates digital images of your teeth with a 3D scanner. 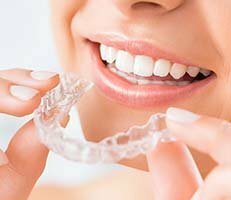 Before fitting you with your Invisalign braces, he discusses your treatment plan, such as the expected movement of your teeth and how long treatment should last. Once your Invisalign aligners are ready, Dr. Visot explains the rules for wearing them. You must wear them at least 20 hours each day for optimal results, but you can take them out to eat, brush, and floss. Dr. Visot schedules follow-up visits to monitor your progress. After treatment, you may have to wear a retainer for a while to maintain results. However, the key to long-term success is good, at-home oral hygiene practices, like brushing and flossing regularly. Dr. Visot can make regular alignment changes to your Invisalign braces to speed up treatment. With traditional braces, this isn’t possible. Trials have proven patients with Invisalign achieve far more predictable tooth movement, resulting in straighter teeth in less time. Invisalign braces are comfortable, fit well on your teeth, and are easy to take off and put back on. Invisalign braces can treat even the most complex cases of crooked or misaligned teeth. Proprietary innovations help Invisalign move your teeth more precisely than traditional braces. Call or use the online booking tool to meet with Dr. Visot and find out if Invisalign may be right for you.